Following his performance in Atlanta, Ga. on Saturday, July 14, 21-year-old Cascades baritone player, Zach Smith, talked with DCI.org's Christina Mavroudis about how marching as a member of the Cascades for six years has affected his life outside of the drum corps activity. CM: What first got you involved in drum corps? ZS: My high school band director was the brass caption head here at the Cascades a while ago, and he called me up to fill a spot. I was 15-years-old that year, and I had nothing better to do that summer, so I said yes. I've been here ever since. CM: How long did you know about drum corps before that summer? ZS: Only just a couple of months before actually, since that previous fall. But after I did it that summer, I was totally hooked. It got me into music and completely drew me into this whole activity. CM: Has being in the Cascades for so many years influenced other parts of your life outside of drum corps? ZS: Yes, I'm actually a music education major and I will be student teaching next year. I'm studying this so I can one day be a high school band director, and being in the Cascades has definitely helped motivate me to pursue this career. CM: Was there a specific moment that made you decide that you wanted to do this for the rest of your life? 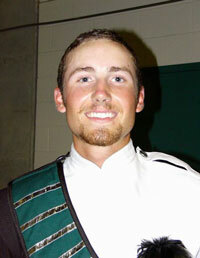 ZS: Probably in my second year in drum corps. When we made the World Championship Finals that year, the energy around us was completely riveting, and it totally got me hooked. After that moment, I knew I would be doing this for a long time. CM: How is this season going so far, especially with so many rookie members in the corps? ZS: It's great actually. The rookies are doing very well, and they are definitely keeping up with the many demands this corps has. Sometimes they fall a little behind, but it's my job as a veteran to make sure they get back on the right track. CM: Any thoughts on "aging-out" this summer? ZS: I've been here a long time, and I think this activity is such a rare experience. I don't have any other close bonds like the ones I have made with the people I march with, and I know that my friends here are my friends for life. I just feel really lucky to have had the opportunity to do this for this long.